Are you a beginner in bike riding? Are you a frustrated individual in the sense that you can’t seem to find a perfect bike for you? Well, fear not. Am going to help you find the fit for you and beginners like you. This is my best area of interest when it comes to outdoor activities. Riding is not just an activity for me. It is one of my hobbies, a passion and I like the fact that it also helps in knocking off some unwanted weight thus keeping me fit. Let’s talk about mountain bikes! Specifically, let’s talk Raleigh Eva 2 mountain bike. Fair warning before I get into it, am all about the details so don’t mind if I get all technical, I promise not to go too deep. First and foremost, this mountain bike is designed and manufactured for women. That alone should make you all giddy about what features it has that makes it suitable for women. Now, it’s not that it’s a sexist Raleigh Bike or anything, it’s just that beginners, especially women go for comfort, excellent maneuverability, and stability. I mean, who doesn’t? So what are the juicy stuff about this amazing product? Right from the start, it is all lightweight because of the main aluminum frame. This is good because you can ride for a longer period of time and cover a longer trail. You can also be sure that both your neck and back are as comfortable as they will ever be since you can choose how high or low you want to adjust your seat and handlebar during assembly. Specifications As promised, I won’t go too deep into the specs but I will make you see the best of the important stuff. I had already talked about the strong and light aluminum frame in the lightweight description so that’s that. The suspension forks are suitable for mountain biking because they are steady and have a nice feel. They soften your riding experience. Are they the best raleigh bike for beginners? Absolutely! The Raleigh Eva 2 mountain bike also comes with a cushy, wide plush saddle that ensures maximum comfort on whichever terrain. The handlebar is made of steel so you can check “strength” out of your list. The grips on the bar ensure a great feel to the touch while riding. The brake levers are manual and are made of a solid metal alloy which provides excellent control. The best part about all things hands on is the gears. You have 24 speeds to choose from for any terrain. This makes the Raleigh Eva 2 an affordable bike for the flexible pavements and harder terrain. The Raleigh Eva 2 mountain bike features the KMC chain. Why this kind of chain? A new KMC chain is guaranteed to last longer than other brands out there. KMC chains function well with most or rather, all gear systems. This means that gear Shifting, mounting and long life are key attributes of KMC chains. Aside from this, it is super lightweight and runs smoothly. This is basically a unique guarantee. The tires are one of the essential parts of a bike especially when it comes to grip, maneuverability and area covered. The Raleigh Eva 2 mountain bike features the Kenda slant six tires. This tire is has proven to be best for the beginner, intermediate and hard pack terrain. The Slant Six tire has an excellent grip, in both the treacherous and non-treacherous turns. The tires feature cornering knobs that are located down the casing. this makes your turns more precise and less limited. These tires are designed for speed and grip. With all these said, I can’t honestly stress enough about how efficient this product is. What qualities are you looking for when it comes to a mountain biking as a beginner? I bet money I have all of them up here and I stand by my evaluation. Remember, The devil is in the details”. 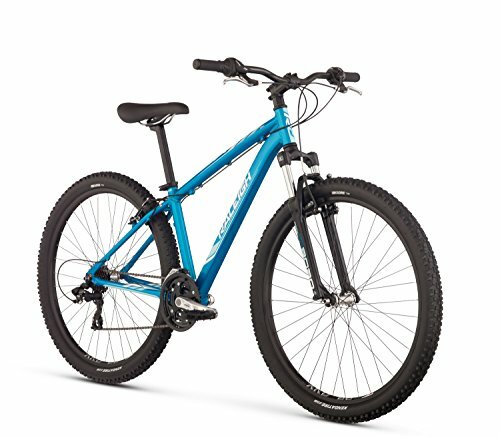 I wish I could go deeper into the specs but I promise that these are the best beginners specs I know when it comes to The Raleigh Eva 2 mountain bike. So, check it out and go get that bike ladies!! It the best out there for beginners.